Gas chromatography/mass spectrometry (GC/MS) is an analytical method that combines the separative features of gas-chromatography with the identification capabilities of mass spectrometry to identify unknown organics in a sample. 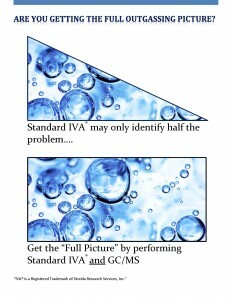 It is a natural complement to standard IVA® testing. GC/MS testing allows for comprehensive testing of a variety of different substances and sample matrices, from individual compounds to complex mixtures and polymers, offering a level of sensitivity, speed and analysis that cannot be beat. ORS offers organic mass spectrometry testing services and method development services to clients across a variety of industries and a wide range of products. Oneida’s GC/MS analysis services can be performed via Static Headspace, solvent extraction and direct injection, direct air injection, residual solvent analysis, gas cylinder analysis, IVA® of hermetic devices, and outgassing of samples sealed in ampoules. Testing is qualitative, semi-quantitative, and can be customized to suit your analytical needs. Testing capabilities and a partial list of applications are presented below. Gas Chromatography/Mass Spectrometry (GC/MS): Common applications of ORS’ GC/MC analysis services include contamination identification, material outgassing studies, purity determination, and identification of “unknown” compounds in bulk organics. Internal Vapor Analysis® Gas Chromatography/Mass Spectrometry (IVA®/GC/MS): Used for the analysis of organic constituents in the cavity of hermetic packages and ampoules, identifying of volatile and semi-volatile organics. Package volumes as low as 8 nL can be tested. Static Headspace/Gas Chromatography/Mass Spectrometry: A useful technique for the analysis of volatile and semi-volatile organics off-gassing from low concentration components in bulk materials, including solid and liquid matrices. Direct Air Injection/Residual Solvent Analysis/Gas Cylinder Analysis/Gas Chromatography/Mass Spectrometry: Used to analyze components of gas phase samples for volatile and semi-volatile organics. Incorporates Liquid N2 cryofocus for improved chromatography and sensitivity. Samples can be whole air/gas samples collected in gas sampling cylinders provided by ORS, pharmaceutical products in hermetic packages, or other suitable containers containing gaseous samples. Customized report formats available. Call to discuss options. Our experienced technical staff is available to discuss your specific application and recommend a test plan that will fit your individual needs. Contact us at 1 (855) ORS LABS.